When a reader recently quoted me from a four-year-old post, I realized I needed to update a few of them. I've learned some things in the past few years and, like many of us who research retirement finance, my thinking has "evolved." Sometimes reading an old post is like seeing a photo of yourself from 1975 with mutton chop sideburns a la Neil Young and saying out loud, "What was I thinking?" 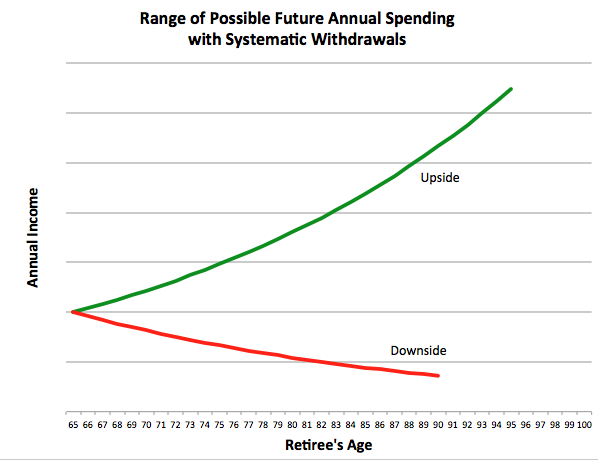 One such post is Unraveling Retirement Strategies: Floor-and-Upside, from February 6, 2014. I've made a few changes to reflect my updated perspective and to incorporate some of the excellent reader comments that post attracted. Specifically, I've become more enamored with annuitites and less with TIPS ladders. The floor-and-upside strategy for financing retirement is sometimes referred to as “safety first” and derives from The Theory of Life-Cycle Saving and Investing. 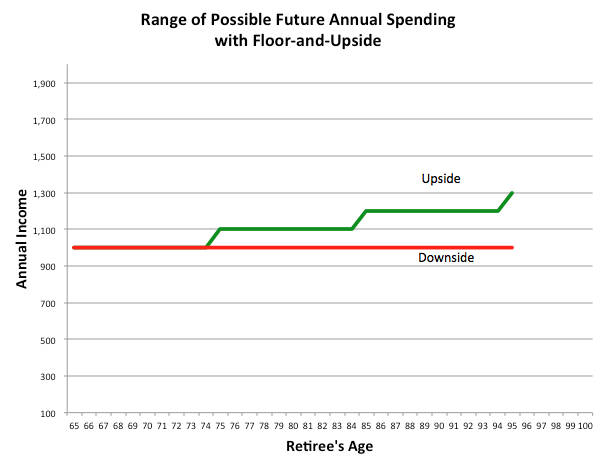 The basic idea behind floor-and-upside is that a retiree devotes some of her retirement funding assets to building a lifetime stream of income and the remainder to an investment portfolio to provide liquidity and the possibility of increasing wealth over time. It's important to note that growth of the upside portfolio isn't guaranteed and, in fact, the "upside" investment portfolio may shrink over time or even be depleted prematurely (an "upside portfolio" also has downside). The "floor" is a safety net that will provide income should the upside portfolio fail. 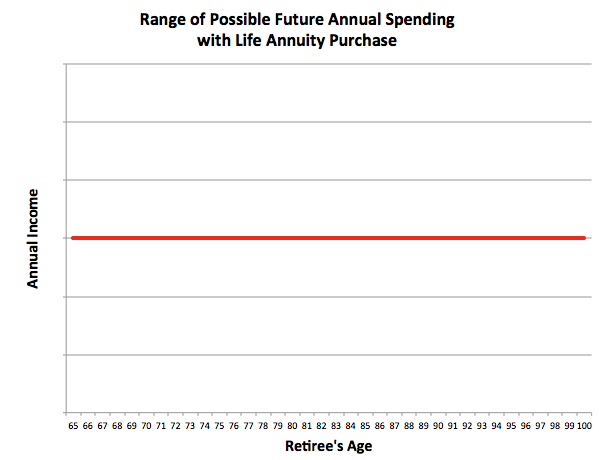 The rest of your retirement plan should ensure that having to live off the floor income alone is very unlikely. Assets suitable for constructing the floor portfolio include Social Security retirement benefits, life-contingent annuities, and pensions. A TIPS bond ladder is not guaranteed to last a lifetime but it is conceivable that one could be built for 35 years, for instance, that would be highly likely to outlast a joint lifetime. Whether or not the cost of the ladder would be acceptable is another matter. You could build a really simple floor-and-upside strategy by using part of your retirement savings to buy a life annuity to guarantee a certain amount of income for as long as you live and then investing whatever is left of your savings in an S&P 500 index fund. 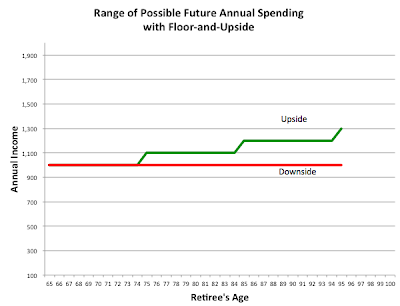 In fact, since most Americans are eligible for Social Security retirement benefits, most Americans have a "floor." Those who also have some savings to invest in retirement, therefore, have a floor-and-upside strategy. Social Security benefits alone, however, may not provide as much floor as desired. Deciding how much floor income you should build into your plan is sometimes easy. I've had clients say, "I don't care about upside potential, I'm not as impressed with my husband's investing skills as he is. I just want a check in the same amount monthly for as long as I live." This is a person who wants nothing but floor. I also have had clients and readers say, "I believe in my investing skills and that the market will always eventually go up throughout my lifetime." Since some suggest that they should invest their Social Security benefits, too, I assume there is a group of retirees who want no floor at all. In between these extremes, the decision can be more difficult. The best I can recommend is that you imagine that you are 85 and your upside portfolio balance just went to zero, a victim of sequence of returns risk. What is the least amount of income you could have remaining that would not make your life an economic misery? This is the floor level you wish to have. The next question, of course, is whether you can afford that much floor and your level of wealth may or may not dictate that you choose a lower level. Interest rates are historically low at present so floors are expensive. Here's an example. Let's say you want to spend $60,000 annually in retirement and your household expects $30,000 from Social Security retirement benefits. Non-discretionary spending totals $48,000 of the $60,000 total. (The floor doesn't have to be your non-discretionary expenses, it can be whatever makes you comfortable, but that's a reasonable starting point.) You have saved a million dollars for retirement. 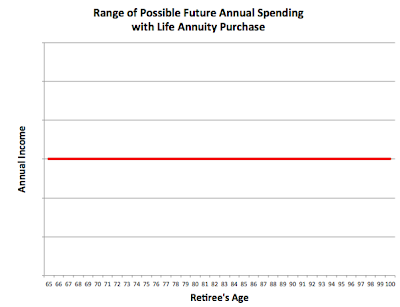 You need another $18,000 of longevity-protected income. 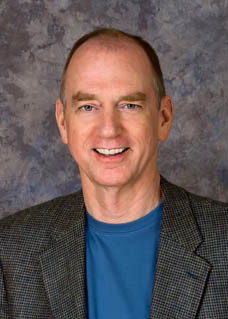 Wade Pfau's Dashboard (or a quick online annuity quote from someone like myabaris.com) tells us that a single-premium income annuity (SPIA) for a 65-year old couple today will generate about a 5.63% payout at today's rates. Divide 18,000 by .056 and you can estimate that you need to annuitize about $320,000 of your savings to generate the safe floor you desire. Invest the remaining $680,000 in stocks and bonds (I recommend index funds) and you have a floor-and-upside plan with $48,000 of longevity-protected income (from Social Security benefits and the SPIA) in the unlikely event that you prematurely deplete your savings portfolio.